Mahatma Gandhi always preferred “production by masses over mass production”. We need to understand the inherent advantages in Gandhi’s proposal for a sustainable economy and equitable wealth distribution. Prof Anil Gupta during his visit to Warangal in October, 2009, suggested creating a “Social Venture Fund” for promoting the entrepreneurs of the dist. Many entrepreneurs do not start their ventures due to lack of venture funds and thereby the society loses out on the entrepreneurship of rural people. Warangal though has an annual trade of over 1000 crores, it does not have any significant industry. While the investment is available with traders, considerable number of entrepreneurs in the dist has no access to it. We need to fill this gap by creating a Fund, say Rs ten crores, which is available on merit to any entrepreneur of the district. The elders of the society need to create a climate in the district for promoting youth to venture into small enterprises, which cater to the needs of the district. These bold men and women can come from anywhere as long as they are natives of the district, and passionate about serving the people of Warangal dist. Exporting goods out of district could also be considered as secondary purpose. Criteria should be laid down and a committee consisting of few eminent persons with social, financial, commercial, management and logistics background identify the potential entrepreneurs. Broader aim being to approach self sufficiency in the district by promoting production within the district, utilizing local resources, local people, for local customers and with suitable technology obtained externally. Produce items required by people of Warangal within the district. Utilization of the available investment within district for its rapid growth and self sufficiency. Attempt to produce products which are useful to the majority of the villagers and at an affordable price. Undertake manufacture of those devices and equipment, which enhances the productivity of rural people. Make products to the choice and needs of people of Warangal. Create jobs and prevent young people choosing entrepreneurship over jobs. Retain talent in the district by creating opportunities to make their dreams realize. Provide cheaper, appropriate and quality goods to the people of the district. Build a strong sense of belonging in the district among all sections by displaying sensitivity to the each one of their needs and aspirations. Give an opportunity to the wealth created in the district to distribute itself over many people in the district. Towards building a happy society with sustainable development, equitable wealth, peace and compassion. In one word “SAMRUDDHI”. A group of like minded elders of the district may come together to formulate guidelines to create and utilize the “Social venture Fund” in Warangal district. Honeybee AP and NIF are willing to facilitate the process throughout. · To provide funds to local entrepreneurs who prose to manufacture goods and services for the people of Warangal district using the local resources, generating employment to locals, preferably replacing full or part of the present imports to the District. · To add value to the local produce using appropriate technology and using local human resource, for the purpose of export out of district for earning more revenue for the people of the district. Provide at cheaper prices but at competitive quality to the consumers within the district. · Ensure the available surplus financial capital is employed mostly within district to generate employment, reduce imports and enhance the value of exports. Leverage the social capital by promoting and mentoring the new generation of entrepreneurs in hundreds within district irrespective of the geographical location and education. o Reduce two items now being imported into the district equivalent to 20% of the entire imports. o Develop skilled workers required by the agro-industry within the district by practical training in the field. o Increase the productivity of Cotton, mango and chilli farmers by 20% through supply of appropriate technologies and traditional sustainable methods. · Eminent elders known for their service to the people of Warangal district. 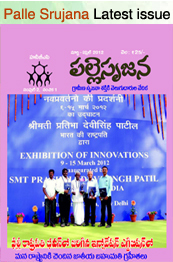 · Natives of Warangal district with passion to see Warangal a sustainable, model to the entire country. · Young and dynamic leaders of the society, wherever available in the district. · Women who understand the people and their needs. · Retired Defence, IAS and Police officers who are settled down in the district after retirement to keep in touch with roots. · Eminent educationists of age above 70 years. · Industrialists above the 70 years of age. · Progressive Farmers of any age. · Tribal leaders who took up the cause of sustaining the traditional knowledge and practices. · Few artists of folklore and fine arts. Initially, the SWZSS may have only 20 members drawn from above categories and each member will have a term of two years. One third to be changed every year. This will ensure adequate continuity. Special invitees with no voting rights could be co-opted based on the type of discussion and the agenda for each meeting. A panel of such special invitees could be drawn up and nominated for each meeting ‘as on required’ basis. Idea is that the decision making is in the hands of committee members and the special invitees may provide their views and expertise on a particular agenda. The SWZSS should not be doing what the formal system or NGOs are doing now. Their actions and initiatives should supplement or complement the other plans of district development. The area of entrepreneurship should be so selected that no other organization should feel that they are being encroached upon. This is possible with deliberate effort and clearly understanding the role of other agencies operating in the district. It should be the endeavour of the SWZSS to remain the key committee and yet not tread upon others responsibilities. A day should come when all other agencies in the district should consider the role of the SWZSS first and then plan their activity. I am sanguine such a day is not very far as SWZSS “manasa, vacha, karmana” should endeavour to bring tangible, sustainable and equitable growth to the people of Warangal district in a reasonable time line. Undertake wide publicity of the SVF and its objectives to reach every all 1800 villages of the district. Invite applications from potential entrepreneurs on a simple format. All of them may not be able to prepare a business plan. SWZSS, based on prima facie examination of the idea, may assign mentors to prepare the business plan and present it to the SWZSS. Decision is taken after examining the case with high level of objectivity. · Elders and well wishers from the district to decide on the constitution of SWZSS. · Formation of Search Committee to select members for SWZSS. · SWZSS is constituted. Elect Chairman preferably unanimously. · Form sub committees to frame Rules for resource generation, accounting and implementation methodology for achieving the objectives of the SVF. · Commence functioning. Give wide publicity of SVF and its objectives. · Invite applications from entrepreneurs. · Approve first batch of entrepreneurs. And go on…………..till Warangal district becomes a model to the country and entire world within 5 years with equitable, sustainable and high rate of growth and enhanced quality of life.